I’ve been busy drawing and tracing various vector graphics in order to create a comprehensive logo & icon kit for my latest free design resource. 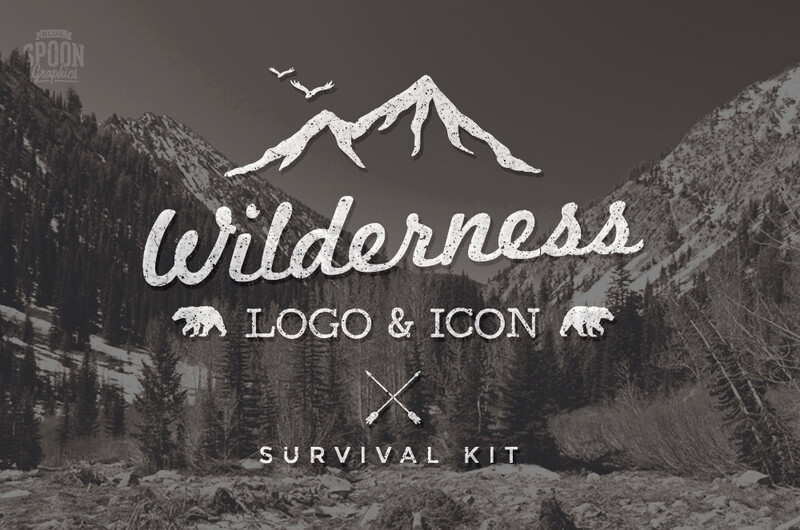 The Wilderness Survival Kit is a collection of 60+ vector graphics and 7+ ready made editable logo templates based on the popular theme of the great outdoors. Easily build logos, emblems, badges and t-shirt designs for all kinds of outdoor pursuits such as camping, fishing, scouting, hunting and bushcrafting. Copy & Paste these elements to easily build outdoors themed designs of your own. Also included is 7+ ready made logo and badge templates that can be used as a base for your own identities or customised directly. In order to edit the ready made logo templates you’ll need to grab these free fonts: F25 Executive, Snobhandscript, Rio Oro & Montserrat. It’s beautiful, thank you very much for offering this for download! Thank you Chris, these are wonderful. Another fantastic resource! So helpful like always Chris. Thank ya sir! These mountains are awesome! These are so fun! Thank you for the wonderful art and great resources. Really appreciate the links, very considerate. Thanks for share, this is great! Thanks for sharing! Appreciate your hard work to keep us all afloat! Great stuff as always Spooner, just got yourself a new dedicated visitor! Thanks! Man this is great. Thank you! These are fabulous! Love them. Thank you so much! These are awesome! thank you very much, Chris! So great! Hi! these are awesome! Just one question. Are these also for commercial use? I’m planning a revamp of my beloved one’s fishing website so these have provided some much needed inspiration (and way better artwork than I can muster) so many thanks Chris! Wow! So awesome, Chris. I’m imagining lots of uses for these. Can’t wait to dig in. Thank you, the freebies are very useful! so great Chris! it’s just amazing you’re offering all these stuff for free..! Its awesome. Thanks for sharing. Thanks Chris!!! All your resources are fantastic!